When drawing the sphere perspective has no meaning, since the sphere looks like a circle from any angle. The most important part of drawing a sphere is showing its volume. You can do this by carefully examining the light, shades, the reflected light and highlights. To draw a good circle, you can first draw a square and then draw the circle inside it. Notice that the sphere's shade on the table has the shape of an ellipse. While drawing, try to see the object as an image. Be bold with your lines and don't worry about making mistakes. You can always fix them later. Don't worry about the construction lines or smudges. 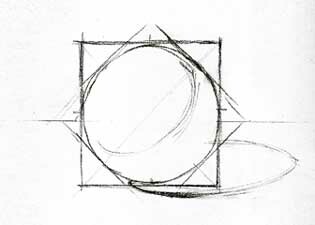 An example of how to draw a good circle by first drawing boxes. After some practice you will be able to draw a good circle without using boxes. 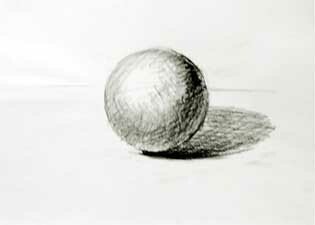 The sketch of the sphere from the video.